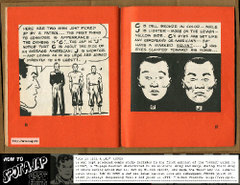 1942 US Army & Navy's HOW TO SPOT A JAP Educational Comic Strip (from US govt's POCKET GUIDE TO CHINA, 1st edition). Hilarious. Class is in session, get some TalkingCock in Parliament, your teacher today is Dr Kirpal Singh at mrbrownshow.com. 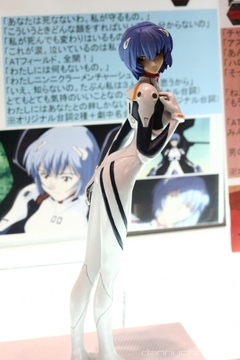 Check out these finely sculpted toy figurines, Chara Hobby Girls, at Danny Choo's. 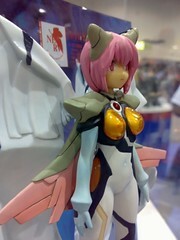 As my toy-fan friends would say, "Chio!" More TalkingCock in Parliament, go watch the show-stealing Ruby Pan at mrbrownshow.com. Missed the TalkingCock in Parliament event? 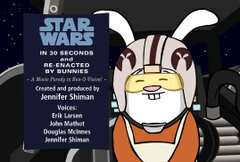 We have video clips! Watch Imran Johri's segment at mrbrownshow.com. Darth messes with his General. Find out why Pluto lost its status as a planet at mrbrownshow.com. 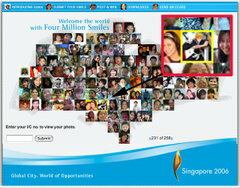 Go to the Smile Singapore site and look at this. Lightspeeder, you damn sabo king lor, lol. 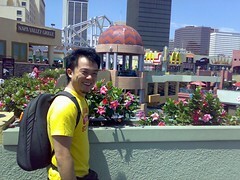 I have been using the Nokia N73 for a while now, way before it got to the stores, courtesy of Nokia. And I can tell you, I love this phone. I really do. Three things blow my mind. First of all, let's get the specs out of the way. The 3G phone is dual mode, triband. I used it in our US trip, no problems. Except when LA had that power failure which knocked out mobile phone base stations, but that one is not the N73's problem. Internal memory is about 42mb, which is good, because it lets you use the apps more. My N70 had way less memory and I believe this slowed it down somewhat. The improved Symbian software and larger memory on the N73 really made the phone snappier and less prone to crashes. The N73 uses mini-SD, and I was using a 2gb card I bought, which is huge. I loaded it up with video clips, a few music albums, and still had space for a ton of photos taken at full resolution. The card is hot-swappable, which means you don't have to open up the whole battery compartment to get to it. Just slide it out from the botton bay, and you can take it out to copy files or hand it to the photo lab. My only gripe is that the memory bay area below is a bit of a pain to open. The camera is 3.2 megapixel with Carl Zeiss optics, easily the best mobile phone camera I have ever used. It got to the point where I stopped using the Canon A75 I brought along to the US, and just snapped with the N73. With auto-focus and a decent flash (also love the macro function, I took a lot of toy photos with it). The screen is a bright 2.4 inch QVGA (240 x 320 pixels) TFT color display. This is a lot more screen real estate than previous or even some of the current N series phones. For a person like me, who surfs the web and reads email on his phone all day, the larger screen means sharper fonts (even at small sizes) and less scrolling around. Since I am talking about surfing, the new web browser on this phone is a joy to use. Based on Safari, I am told, you can save RSS feeds, browse your history visually, and scroll around large web pages with a thumbnail view. Very handy. The N73 comes with a Flickr uploading app you can use to send stuff to your Flickr account. Once you configure your phone and Flickr at the Flickr Nokia page, you can send direct to Flickr from your N73 Gallery page. Personally, I email photos from the Email app in the N73, because I send via Flickr to blog and because old habits die hard, but the Flickr app they provide is good for sending to Flickr alone. Another part of the phone I recently discovered is the music. I loaded up my mini-SD card with some of my latest music, and just this morning, I decided to try on the headphones provided while having breakfast, because I left my iPod in the car. The FM radio worked beautifully, and the sound quality from the mp3s was excellent. Now if I can get a good pair of Bluetooth headphones, the N73 will be my phone, camera and music player all rolled into one. I am told there is a Bluetooth keyboard from Nokia that will work with this puppy. Hmm, that would be great for emails and blogging. Must try that out soon. 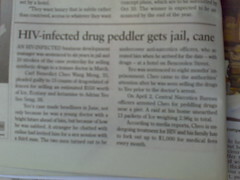 What does being HIV-infected have any bloody thing to do with being charged as a drug peddler? Even if the story is that he sold drugs to pay for treatment, the headline does not indicate that (nor does the body copy for that matter). Don't be a mediocre protester, listen to this podcast and find out how, at mrbrownshow.com. What an event! My friend Steve said he laughed till his face hurt. My wife enjoyed every minute of it, even though she sat through the whole thing without me (Miyagi and I were backstage most of the time). Old Parliament Chambers was filled with people, I heard they even had to turn some people away. And the air was electric. You could feel the buzz and energy in there. And no, no one slept through this sitting of Parliament. Just an hour before the event, Miyagi and I rushed out to get ourselves some floral shirts, but could not find the long-sleeved orchid print ones we wanted. 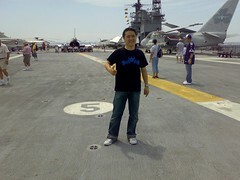 Hence these XXL short-sleeved shirts which cost us $5 from a shop near Parkway Parade. We almost bought another floral shirt but the auntie told us that that was a blouse, and the men's shirts "are over there". She looked at us real strangely the whole time we were in the shop after that. 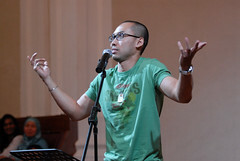 One by one, we took the stage, using the five minutes we were given to share a word or a song, about what being Singaporean meant to us, each story melting into the next, weaving a collection of vignettes into a tapestry telling the Singapore Story. In fact, everyone who got up on stage was good. 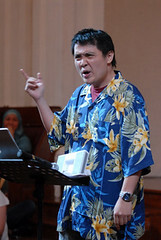 There were funny moments galore (Hossan sang a hilarious updated version of We Live in Singapura, to the tune of We Didn't Start the Fire), and many touching ones too. Yen Yen's piece was particularly poignant. 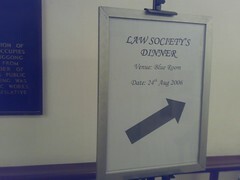 Next door to the TalkingCock event, was the Law Society Dinner. So convenient, if anyone broke the law in the TalkingCock event, next door got so many lawyers can help to sue. Haha! On the way home around 10.30pm, I realised that it was the first time my wife had ever seen me on performing my antics on stage. That made it all the more special, and I am glad she decided to come along on such short notice. I dropped her off at home, and then drove off to the office, to finish post-production for next morning's mrbrown show, strangely energised despite the full day. You can also see more links to more Flickr sets and photos, and blog reviews at mrbrownshow.com. Big thanks to the organisers TalkingCock.com and InDigNation, for making this great event possible. The memories were real, and the memories were Singaporean presented by a distinguished group of actors, poets, do gooders, podcasters etc etc etc. More real I dare say then " Mee Siam Gate". Each and every speaker within their little five minutes vignette reminded me more abt being Singaporean then a Prime Minister who confuses Laksa and Mee Siam in One and a half hours. The tears of laughther never ending, the smiles were genuine, the people warm and sincere. 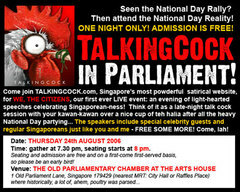 Just a reminder: tonight, 24 AUGUST 2006 is our ONE NIGHT ONLY 'live' event: TalkingCock in Parliament: We, the Citizens, a special closed-door session in support of InDigNation, consisting of light-hearted speeches about being Singaporean. 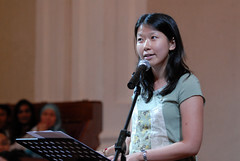 Speakers are all citizens, drawn from a variety of backgrounds, races, and sexualities, a tasty rojak of ordinary Singaporeans and special celebrity guests. You'll be surprised who's speaking! We even have a very prominent member of the Lee family in attendance, though it's not who you might think it is... Let's just say that he's not a man-in-white, but is actually more closely associated with another colour... Curious? Come and lepak with us for a while and find out, lah. Wen die. It'll be at the Old Parliamentary Chamber upstairs at the Arts House, just behind the Victoria Theatre. The proceedings begin at 8, but come early to get seats as it's FREE ADMISSION and seats are limited. See you tonight! Creative win liao. US$100 million leh. Aug. 23 (Bloomberg) -- Apple Computer Inc. will pay Creative Technology Ltd. $100 million to end lawsuits over technology needed to navigate through songs on Apple's popular iPod music player. Listen to Harry King and Fiona See, our new podcast hosts at mrbrownshow.com. Sent to me by reader Nicholas, this Zoe Tay ad in a storefront was spotted at Adrants.com. "My secret to beautiful skin? I swallow." I have completely lost my voice. The cough that went from Faith, then Isaac, has now been passed to me, in the form of laryngitis. I had been nursing a pain in the throat for a few days but kept pushing it, and last night, just after recording the Tuesday show (stem cell salesman), the voice just went. Just like that. Thoroughly silenced, I staggered home at 3am, with the merry band who stayed back to help with the T-shirts (shoutouts go out to Steve for his great email blast database work) and show (Mr Tan, for his heartfelt performance as the stem cell salesman). 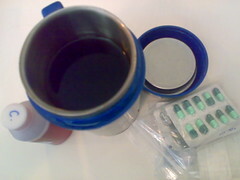 This morning, after a visit to good ole family doc, Doc Lo, I have 4 meds to take, and mom made me a round of Luo Han Guo to drink. What makes a world-class stem cell salesman? Download the podcast from mrbrownshow.com to find out. A Nation in Concert is a show performed by over 100 performers with different forms of disabilities. 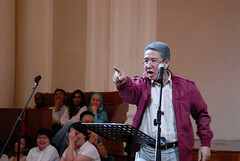 The concert will be held at Esplanade Concert Hall on Sat, 9 Sept 2006, 3pm and 7.30pm. Details at www.anationinconcert.com. Please go and support, ok? "A group of volunteers like myself have come together to organize a show showcasing that talents of disabled people. We believe that everyone should be given a chance for meaningful life. Many of our limitations are set by wrong perceptions and prejudices. We have proven to the audience in our inaugural show last year when over 100 performers with different forms of disabilities, along with volunteer theatrical celebrities, took the stage at the Esplanade to perform. Our audiences loved the show and have asked that we re-staged the show for more people to watch it again. Hence, we are back by popular demands. As we are volunteers, we do not have much fund for major TV, Radio or Newspaper ads. However, this being a people project, we hope to enlist the helps of our friends and loved ones to spread the news and to get more people to watch. We believe we will again win the audiences to standing ovation. Many more will be inspired, touched and challenged to change their negative perception of disabled and marginalized people."